modernization to take place when it opened itself to Commodore Perry and the west in 1863. This regime closed Japan from the outside world and allowed the society to be viewed as backward in the eyes of foreigners. Yet there is another view that the Tokugawa regime and the institutions created during this time in fact contributed to the development and modernization of Japan. One such system is the sankin kotai (alternate residence), which regulated, controlled, and to an extent impoverished the local daimyo stretching from the northern to the southern regions of Japan. Though originally intended as a control mechanism for the shogun, it had spillover effects that indeed stimulated the Japanese economy and society in the Tokugawa period. Looking more in-depth of the rules and procedures, a cost-benefit analysis, and the socio-political and economic forces that it produced will help illustrate how this system became beneficial to Japan’s modernization and entrance into the Meiji and modern era. The words sankin kotai broken down and translated to English describes this system. Sankin loosely translated means “reporting for audience or service” while kotai refers to “alternate” or “rotate in shifts”. The whole practice gradually evolved adding new components and standardizing older ones. Providing sankin was first recorded in the thirteenth century during the Kamakura shogunate. This idea was to be “applicable to any obligatory appearance by an inferior before his lord or patron to perform services” (Tsukahira, 28). Once the Tokugawa shogunate was established in 1600, the daimyo reported to Edo on a voluntary basis as a means to show homage and provide assistance to the Shogun. For example, under the bakufu system existing at the time, the daimyo were “obligated to assist on various construction and engineering projects at the capital” (Tsukahira, 40). Thus the various daimyos had to provide materials, labor, and money to aid in construction that can be financially draining. An example of the daimyo lords’ sankin was in the construction of Edo Castle, the home of the shogun and today’s imperial family, in 1606. Since projects like this would take time, daimyo’s would occasionally depart back home and then return to the project. This was done at certain intervals, which represents the spirit of sankin kotai yet later, this idea would become not just customary, but formalized and required for all daimyo. Later in the Tokugawa era, the Chinese character (kanji) for writing “kin” in Sankin was written with a different character that whose meaning and translation specified that it was the shogun and imperial audience who were to receive sankin duties. It became customary that those performing sankin kotai were the daimyo that had to have alternate attendance and reports to the imperial command, namely the Shogun in Edo (Tsukahira, 42). In 1610, the daimyo’s families now were ordered to send the families of their chief retainers as hostages to be housed in Edo. Thus this illustrates how the central Tokugawa government was able to control the daimyo, allowing them to be seen as subjects under him. This customary system was formally established under the third Tokugawa shogun, Iemitsu. This regimented system had three components. First, it issued the orders that specified how long the daimyo had to make visit to Edo. Here the time or season of the year and their stay in Edo were given out by the Shogun to these daimyo lords. Usually there were many daimyo that would enter into Edo and at the same time a number leaving Edo. Linking to this idea, the second components fixed the times that each daimyo had to render attendance to Edo and the date that they were allowed to depart back home. Upon departure from Edo, the third mandatory component was enforced. The daimyo lords were obligated to keep their wives and children in residence at Edo. Reasons for all these specifications was to allow the shogun to demonstrate a relationship of superiority and inferiority between them and the daimyo (Tsukahira, 36). In addition, having this fixed times also was seen as a means to control congestion in Edo allowing only certain daimyo and their entourage to enter the city. Thus it shows that the daimyo lords were not equal with that of the shogun. The last component first customarily was done by the daimyo as a sense of trust and loyalty to the shogun, but later that would change to become as a control mechanism for the daimyo as they returned back home. In addition, this use was viewed as a guarantee of loyal behavior to the shogun especially in those in distant domains where these daimyo may cause uprisings or revolts against the shogun. Therefore, this system provided a system of checks and balances, with the shogun being more powerful and equal than the rest. The daimyo processed from their feudal territory onward to the shogun’s residence in Edo. In the Shoku Nihongi (Chronicles of Japan), more detailed descriptions on how the sankin kotai was to be done. There were two issues that were recorded. The first one stated that “no one is allowed at his own pleasure to assemble his whole clan within the limits of the capital”, and secondly, “no one is to go about attended by more than twenty horsemen” (Tsukahaira, 43). This appears to keep the daimyo from having a strong army on the journey toward Edo, which could be a threat to the shogun’s security. Again, the establishment of the sankin kotai was done voluntarily but by 1651 it had become more defined as an important part of the Tokugawa regime. By having this system of alternate residence with family hostages, it made Edo a very important city. Through this description, it illustrates the immense control of the shogun and the very tight security enforced. Since the taking of women as hostages was essential for this control over the daimyo, it was necessary to make sure that they remain in Edo. Thus the uses of the sekisho was important, as it appears that some of the wives of the daimyo who wished for their husbands were willing to sneak out of the capital to be with them. It is interesting to note that this system kept domestic security in check yet allowed for a greater threat from foreign forces. Thus there were many daimyo suggested reforms to the system. Yokai Shonan, a freethinking scholar from Kyushu was instrumental in altering this rigid system to allow more flexibility. Some of the necessary changes was because the sankin kotai system provided security domestically at an expense to Japan’s national defense from outside. This was because the daimyo had limited funds to defend themselves in case of a foreign attack. Instead of allocating their resources to fortify their coasts and building up arms, funds were directed toward their sankin duties (Tsukahira, 121). Thus one of Shonan’s ideas was to change the intent of the visit to Edo by the daimyo. He suggested that the daimyo only report to the capital to discuss administrative procedures. Another idea was to repeal the custom of keeping the wives and children away from the local han. Thus it appears that this was a total radical reform, transferring the idea of sankin from a controlling system toward that of a consulting group, actually assisting in policy making. Thus this reform was meant to cut the costs that strained the daimyo. In 1862, there was indeed a reform to the sankin kotai system. The shogun summoned the daimyo who were in Edo at the time to inform them of the changes. Instead of a radical change that some advocated for, the daimyo’s obligations were just slightly lowered. The duration of their stay in Edo was reduced. In addition, they were only required to reside there once every three years (Tsukahira, 135). Some of the reforms by Yokai were addressed, as the daimyo in Edo were to submit their ideas to the shogun on how to administer national policies, address problems that they experienced locally, and provide defense ideas. In regards to the hostage situation, the reforms stated that the sons might be able to return back to their han yet they also may be required to maintain their stay as observers, rather than hostages. Looking at these reforms, it appears that the power of the Tokugawa shogunate in the 19th century was slowly declining as power also gradually was being restored back to the daimyo. As the daimyo were freer from their sankin kotai obligations, many assembled new residences in the old capital in central Japan, Kyoto. Daimyo such as Satsuma, Choshu, and Tosa used the imperial city as their headquarters as they planned a plot to overthrow the Tokugawa (Tsukahira 136). In time, the shogun and officials began to realize their mistake in giving more freedom to the daimyo and tried to reinstate the old sankin kotai system. However the many daimyo opposed the order. In addition, the Kyoto court asserted itself calling that both the internal and external situation in Japan could not sustain the sankin kotai institution. Thus, the sankin kotai system worked to centralize the power of the Tokugawa in an isolationist Japan. Once the daimyo saw that the shogun was interested in relaxing the system which is what the power system was solely based upon, it showed a decline in the Tokugawa. In addition and more importantly, many argue that once isolation was breeched, with national security in jeopardy, the system inevitably would self-destruct which formally did in 1867 (Tsukahira 137). The sankin kotai system was a centralized system of bakufu control over the daimyo which had many impacts to Japan. An example is economic development. 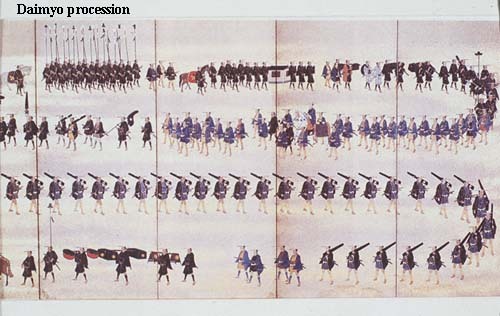 This first can be seen beginning with the procession from the daimyo’s lands to the capital. Many of them were directed to use certain roads, and many traveled on the Tokaido route (Oishi, 23). This route spread from the Kansai area to the Kanto plain becoming a very important and developed highway in Japan today. Since this journey would take several days, the daimyo would make many stops on this route. These stops would then grow to become post towns where the daimyo lords could relax and, have a snack, or lodge for the night (McClain, 58). With this, it helped create cities to cater to these travelers, allowing many cities to become “cities of merchants” as Osaka became during this time (Flath, 25). Moreover, with the wealthy daimyo residing in Edo for long periods of time, Edo would become a major consumption center. In addition, those who accompanied the daimyo en route to Edo allowed the city to grow from a tiny fishing village to a major city, with a population of a million by the 18th century. Flath supports this by claiming that one of the direct impacts of the sankin kotai system was the “massive migration of persons from every part of Japan to Edo” (25). This would make Edo become not only the largest city in the world, but also perhaps the first to reach that many people (Nakamura, 84). As a comparison, Nakamura writes that “neither ancient Rome nor the medieval Chinese capitals of Ch’ang-An and Loyang ever reached a million, although it appears that Peking in the 18th century was in the neighborhood of 800,000 to 900,000” (84). For a western comparison, London had a population around 860,000 during this time. Although created as a control mechanism, the sankin kotai helped transform Edo into a metropolis and truly a uniting center for the Japanese people. Other additional benefits of the system were the ensured peace by keeping feudal lords in subjugation (Tsukahira, 137). Another benefit was that since daimyo lords would have consistent visits to Edo, as well as residing there for a period of time, this allowed an exchange of information from the han outside Edo as well as the exchange of the cultural ideas and developments within Edo back to the han. Tsukahira writes that the “sankin kotai served to bring a large part of leadership elements from the whole country together in one place and to keep a constant stream of leaders and intellectuals moving back and forth between the capital and all parts of the country” (3). In addition, with the processions, attendance, and the hostage situation, all have associated Edo as their home (Tsukahira, 115). Moreover, this exchange kept the central government aware of what was occurring in the han, and allowed a sense of national and cultural unity for the Japanese people. This would help stimulate in Japan’s modernization. The costs of the sankin kotai was the financial drain it placed on the daimyo, an economic and political cost of keeping the daimyo weak in relation to the shogun. 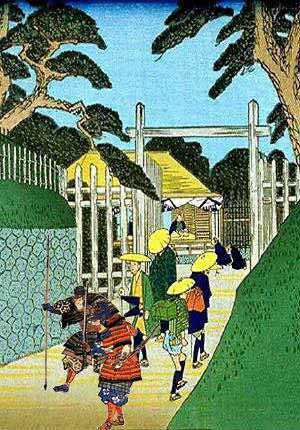 The journey costs alone impoverished the local daimyo especially if they lived far from Edo. The daimyo also had to fund their stay in Edo that became very costly especially if the terms of residence were long. Yet this cost allowed the Tokugawa to maintain its hegemony over Japan until 1862. In conclusion, the sankin kotai system enabled a centralization of power of the shogun and made Edo the heart of it. Edo, renamed Tokyo in the Meiji Restoration would be a great commercial and political city as it is today. The use of this system created the development of a system of communication, spread of information, towns, and merchant citizens. It allowed Edo to the center of Japan. Perhaps this was why the revolutionary daimyo’s of Satsuma and Choshu moved the Emperor Meiji from Kyoto to Edo. Although the opening of Japan made the Japanese realize that they were backward, the internal political peace as well as the economic growth, and social and cultural developments created was able to give a sense of what essentially Japanese is. The sankin kotai was not this, nor was it intended to function as this, yet it helped that idea flourish. Flath, David. The Japanese Economy. New York: Oxford University Press Inc., 2000. Kaempfer, Englebert. Kaempfer’s Japan: Tokugawa Culture Observed. Trans. B.M. Bodart-Bailey. Honolulu: University of Hawaii Press, 1999. McClain, James. Japan: A Modern History. New York: W.W. Norton & Company, 2002. Modern Japan. Ed. Chie Nakane et al. Trans. C. Totman. Tokyo: University of Tokyo Press, 1990. Oishi, Shinzaburo. “The Bakuhan System.” Tokugawa Japan: The Social and Economic Antecedents of Modern Japan. Ed. Chie Nakane et al. Trans. C. Totman. Tokyo: University of Tokyo Press, 1990.